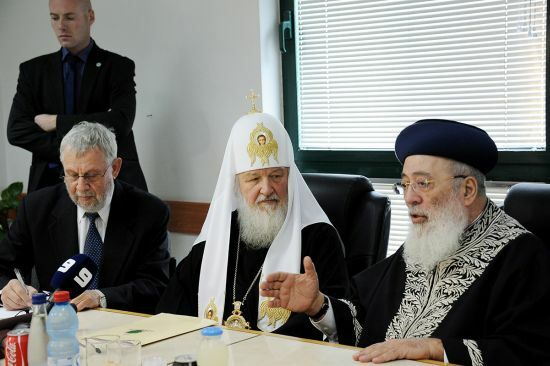 JERUSALEM — Russian Orthodox Patriarch Kirill called on Sunday for closer cooperation between religions at meetings with Israel’s chief rabbis in Jerusalem, on the third day of a historic Holy Land visit. “In our times, when people are giving up faith and tradition, there is special significance to good ties between representatives of different faiths,” he told Israel’s Sephardi Chief Rabbi Shlomo Amar. “Today, when so many people think that the main thing in life is to be free and give up belief, it is all the more important to retain moral values,” he said in simultaneously translated remarks. The head of a community of some 150 million Orthodox believers arrived in Jerusalem on Friday for his first visit since becoming head of the powerful church in 2009. He visited the Church of the Holy Sepulchre the same day and was at the Church of the Nativity in Bethlehem on Saturday, when he also met Palestinian president Mahmud Abbas. Metzger also presented Kirill with the draft of a document containing the fundamentals of religious dialogue. Following the meetings at the chief rabbinate, Kirill met Israeli President Shimon Peres. A statement from the president’s office said Peres expressed his respect to members of Kirill’s religion living in Israel. More than a million Soviet Union expatriates immigrated to Israel in the 1990s, of them a quarter believed to be Christian. Israel and east Jerusalem are currently home to some 120,000 Arab Christians, the vast majority of them Greek Orthodox, according to Israeli statistics. In addition there are up to 250,000 Russian Orthodox living in Israel, according to different unofficial estimates. Israel’s foreign ministry called his trip “the most important (religious) visit (to Israel) since that of Pope Benedict XVI” in 2009. The 65-year-old patriarch will visit Christian holy sites in northern Israel as well as in Jordan, where he will also meet King Abdullah II.